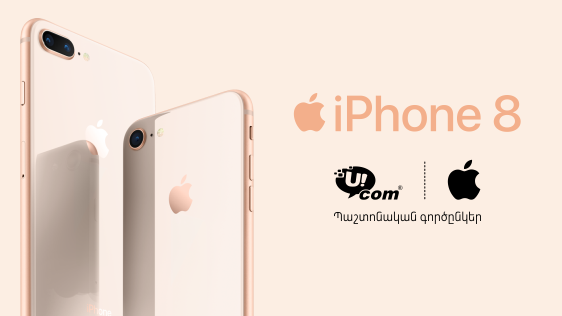 According to the schedule approved by Apple, Ucom, as the official partner of Apple for several years, today, on October 27, has launched official sale of iPhone 8 and iPhone 8 Plus smartphones on the territory of the Republic of Armenia. “This year again the consignment of the latest smartphones intended for our country is ready for full use in Ucom 4G+ network, the only network certified by Apple. In Ucom sales and service centers the smartphones are available in space gray, silver and gold tones. As usual, they are offered with several tariff options,” said Hayk Yesayan, the Director General at Ucom. For example, 64GB smartphone is available for 469,000 AMD retail price. At Ucom the same model can be acquired on the 24-month instalment plan, starting from 0% prepayment, 0% annual interest rate and 0% commission, by subscribing to Universal Plus 5500 or a higher postpaid tariff plan. Plus, subscribers will receive 750 minutes each month to call all local networks, Artsakh, any Russian network, the USA and Canada, as well as 5GB of mobile internet. It should be added that along with the official sale of iPhone 8 and iPhone 8 Plus Ucom has also launched sale of the original Apple accessories with a 1-year official warranty in its Flagship store on the Northern Avenue. Hence, the 1-year official warranty applies not only to smartphones, but also to original audio converter, charging cable, EarPods headphone cords, wireless AirPods headphone cords, as well as Beats Solo3, Beats EP On-Ear, Beats Studio, BeatsX, Powerbeats 3, Beats Pill+ headphone cords acquired from Ucom. iPhone fans will certainly appreciate wireless charging, speakers that are 25% louder, A11 Bionic chip that is up to 70% faster than A10 Fusion chip used in iPhone so far.